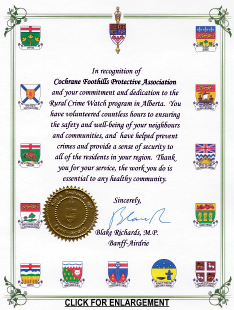 Please check back often to stay up-to-date with what's happening to support crime awareness in the Cochrane, Foothills, West Airdrie areas of south-central Alberta. Our Annual General Meeting held on April 6, 2019 was well attended with approximately 50 people turning out to hear from our speakers and honoured guests regarding rural crime prevention initiatives. The CFPA was delighted to receive a surprise special recognition from Mr. Blake Richards, our local Member of Parliament, shown here presenting to CFPA Board members. The CFPA Annual Report replaces the March Newsletter, and contains information from the Cochrane RCMP, Fish and Wildlife, Rocky View County Enforcement Branch and the Board of Directors. Please take a moment to read through it as it reports on what has been a busy year for us. Membership fees are $20 per household/business per year and can be paid by e-transfer to payment@cfparcw.ca or by cheque via mail. New applicants can complete and submit our Application Form on our Membership page. MEMBERSHIP RENEWALS WERE DUE BY JAN 31. MEMBERS WHO HAVE YET TO REMIT THEIR RENEWALS ARE REQUESTED TO DO SO AT THEIR EARLIEST CONVENIENCE. We are transitioning our email addresses to be directly tied to our new website server, so going forward our general contact will be through info@cfparcw.ca.